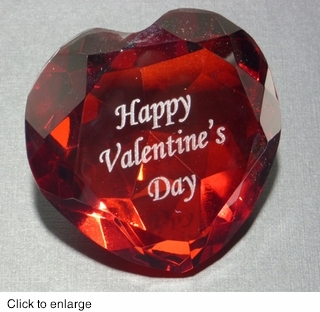 Make this Valentine's Day a special one with one of our engraved heart shaped paperweights. Faceted, Gorgeous, Hand-Cut Glass Crystal Heart. Each heart paperweight comes packaged in a box. 3.125" Diameter, 1.5" Tall. Color of heart may vary slightly from production batch and size.